Thermalframe offers the best of European PVCu double glazing window and door systems that provide exceptional thermal performance, without compromising the aesthetic integrity of your home. Regardless of the style of your existing property or new build project, Thermalframe has the right PVCu double glazing solution to improve the warmth, comfort and beauty of your home. With up to 45% of a homes heat lost through the windows, Thermalframe PVCu is proven to retain twice as much as heat as standard aluminium alternatives. Advanced co-extruded seal technology allows high levels of sound insulation. Non-conductive PVCu frames and optimal air gap within the glazing chamber removes the problem of condensation. Elegant sight lines and narrow beveled profile ensure that Thermalframe can compliment all home types. 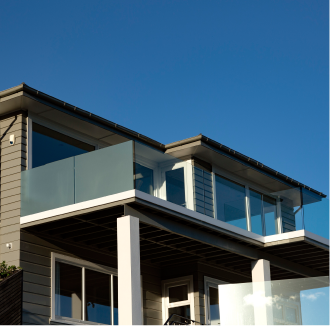 The true benefits from double glazing come from a full system approach. Thermalframe offers the best of European double glazing standards that are ideally suited to New Zealand weather conditions and architectural style. Over 1,000 times less conductive than aluminium, Thermalframe keeps the heat from escaping your home and remains condensation free. Increasing the honeycomb effect of the profile to further reduce conductivity and improve thermal performance. Thermalframe units are specifically designed for double and triple glazing, with optimum 16mm spacers filled with Argon as standard. The combination of low level gaskets and beveled profiles makes for a stylish system that compliments New Zealand architecture. Seals are fuse-welded onto the frames, sashes and to each, providing a continuous weather seal that eliminates potential air and water leakage. High security features, superior weather performance and better sound insulation by keeping sashes extra tight against the entire frame. Specially formulated with additional titanium dioxide and tested to withstand New Zealand UV levels. Thermalframe is made from calcium-based profiles, are completely lead-free, and is a recyclable product. The home is so much warmer and drier since we installed Thermalframe; the best thing we did for our house.